We at eSites Network, a consulting and development company based in Jaipur, would like to share some trade secrets with you to get the most out of your systems, software and web presence. We invite you to eVolve Your Business with us. What Use is Your Companys Emailer if No-one Actually Reads It? Every marketer’s nightmare is the scenario where you’ve sent out this perfectly crafted e-mailer that’s taken hours to refine and polish until it represents exactly who you are as a company and what you really stand for, only to watch in horror as it is rudely bounced out of somebody’s in-box as spam. Obviously, admission to the E-mailers’ Hall of Fame awaits those who can get their e-mailers to the right recipients at the right time and then make sure they’re actually read. Is that such a tough ask? 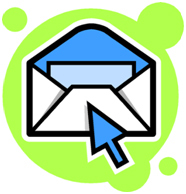 Email Marketing Tracking – Insight into your email campaign performance is essential to maximize campaign effectiveness. Complete message reporting includes opens, clicks, bounces, successful deliveries, unsubscribes, and message forwards. E-mail Response Reporting – Learn about the behaviors of any contact in your account. View how a particular subscriber reacted to different email messages. All feedback should be available to you in easy-to-read charts and tables. Assured Deliverability – Whitelist agreements and feedback loops with major ISP’s ensure that your e-mails are delivered without a hitch. CAN-SPAM Compliance – Make sure your messages conform to anti-spam legislation and privacy laws. Typically you are required to include a valid physical address, provide a one-click unsubscribe feature, and not use lists of purchased addresses that may not have given valid permission. ‘Opt-in Marketing’ is the way to go! Message Scheduling – Prepare and edit your messages on your schedule, but make sure to send your message only when you want it to go out. List Exclusion – Exclude specific lists or segments from receiving a message. Keep it targeted! Signup Forms – Add a signup form to your website to convert visitors from your website into email list subscribers. Automated Subscription Management – Your contacts should be able to automatically subscribe or unsubscribe from their list with no interaction from you. Bounce-Back Handling – Use software to automatically handle bounced messages and remove subscribers after five bounced messages. List Segmentation – Target the most profitable customers on your list and send different messages based on list criteria. Let the software do the legwork for you! So there you have it – awareness is the key. Send out your e-mailer, make sure it reaches, track and analyse its performance, and manage your subscriber list effectively, and you will see a visible impact on your business! Some Trade Secrets © 2015. All Rights Reserved.